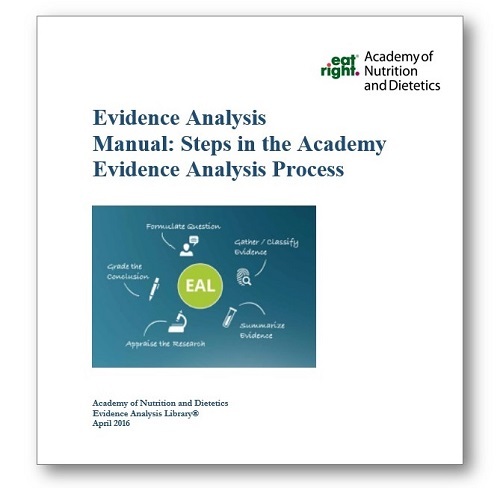 The Evidence Analysis Manual was created by the Academy to guide expert workgroup members and evidence analysts to understand and carry out the process of conducting a systematic review. This 106-page guide explains the rigorous 5-step process followed by the Academy. It includes information on developing 'good' research questions; conducting a thorough literature search; description of research designs; how to appraise a research article; the Academy's risk of bias tool; and much more. Sample templates can be downloaded for classroom use or to conduct your own study. We encourage the use of our methodology and resources. Please credit as follows: ©2016 Evidence Analysis Manual Academy of Nutrition and Dietetics.